When traveling in Canyon Country, timing is everything. Even in early spring, the afternoon sun is unforgiving and there’s very little shade. 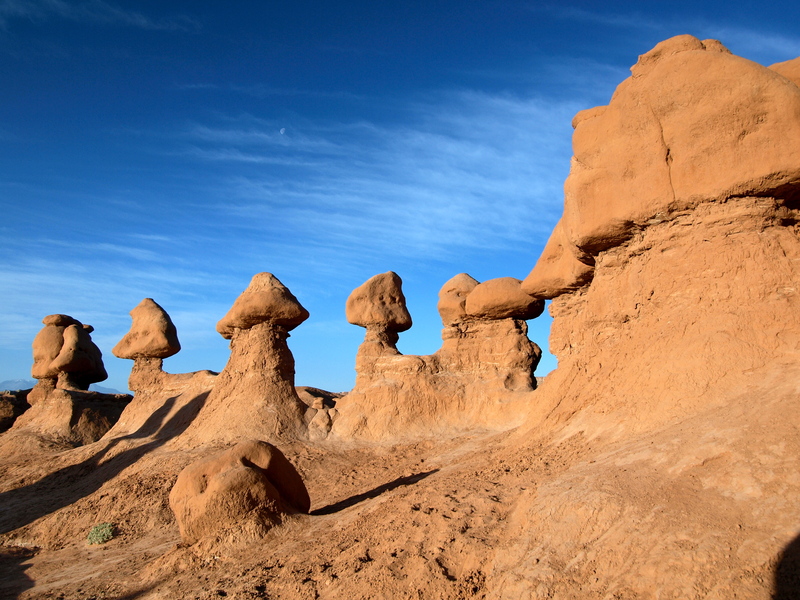 A couple of days ago, I pulled into Goblin Valley State Park at exactly the wrong time: 3 pm. The campground was already full for the night, the parking lot at the trailhead was packed and the hoodoo valley was rippling with heat waves. No way was I going hiking out there. I needed a Plan B. 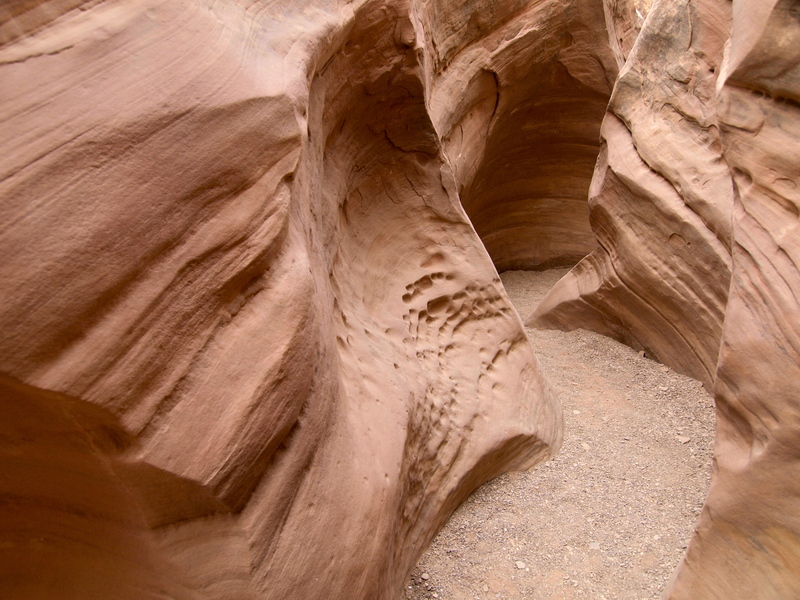 Retreating back to the park’s visitor center, a photo on the wall of a narrow, winding slot canyon caught my eye and I asked the park ranger where it was: Little Horse Canyon, just outside the park. The deep, narrow canyon would afford some shade and I could camp at the trailhead there (for free!) 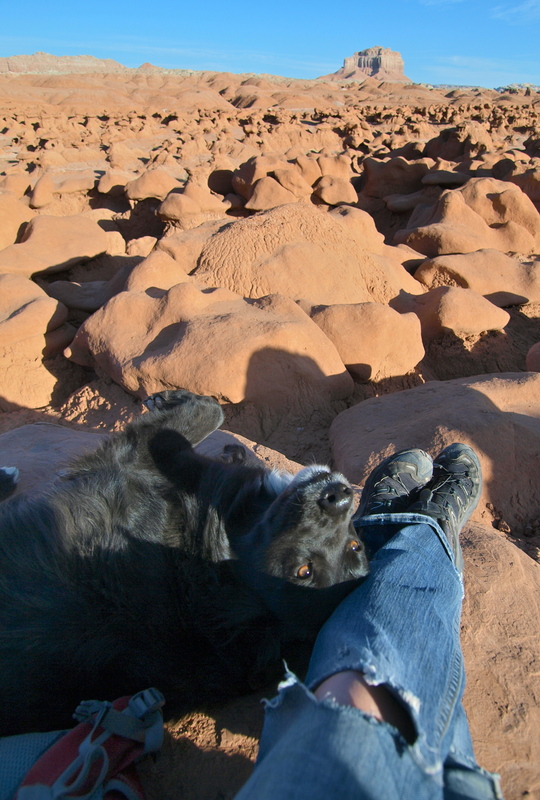 and return to Goblin Valley the next morning. Little Wild Horse forms an 8-mile loop with neighboring Bell Canyon, a popular non-technical trek for families, I quickly learned. I had a few quiet moments in the canyon, but every few minutes, couples with a half-dozen or more kids kept appearing around the next bend. Mormon country. Too many kids, in my opinion, but at least they’re getting out and exploring the world. Bowie was thrilled with all the attention from little hands; Dio was unsure, but unfailingly polite. Threading our way through the canyon, often narrow enough to drag my fingertips along both walls, I kept thinking of vignettes from a fantastic, terrifying book I read months ago called The Desert Cries: A Season of Flash Floods in a Dry Land by Craig Childs, chronicling an incredible single summer when 22 people died in a dozen flash flood events in the Southwest. There’s no danger today; the sky above is bright blue and the weather report taped to the ranger’s desk at Goblin Valley gave no warnings of weather until later in the week. Deeper and deeper we go; the smell of earth is strong, the light from above weak. The tight squeezes make me uneasy, Dio too. 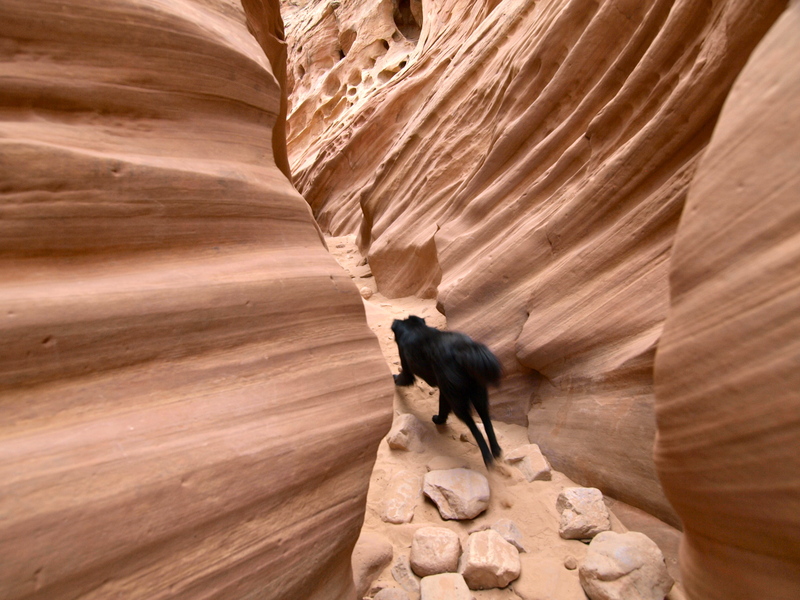 The desert dog knows there’s no easy escape from this place. The word defile comes to mind and sticks. I feel like I’m wading through the Earth’s basement and I want out. 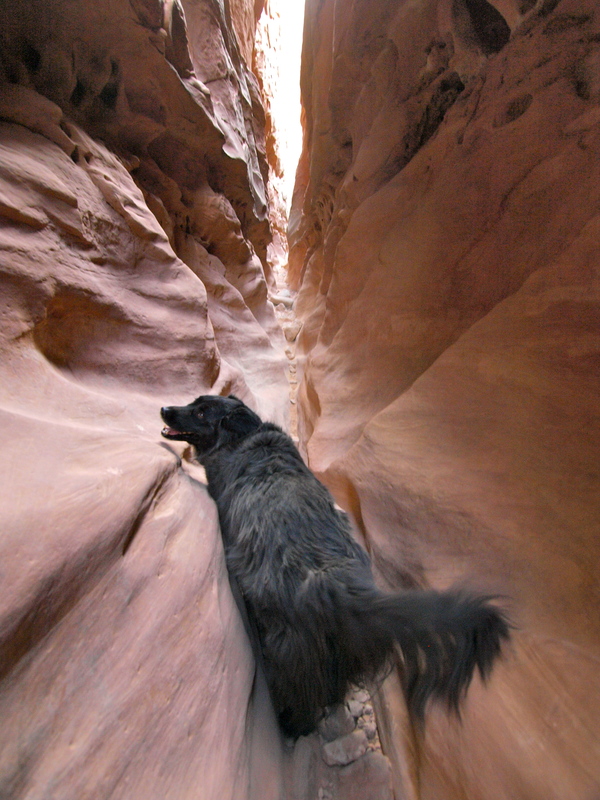 A couple of miles into Little Horse, a boulder lodged in the passage presents a tricky obstacle for Bowie. He looks back at me with eyes that say, please don’t make me go. Bowie’s in excellent shape for a 10-year old dog, but he knows his limits. So we turn around. 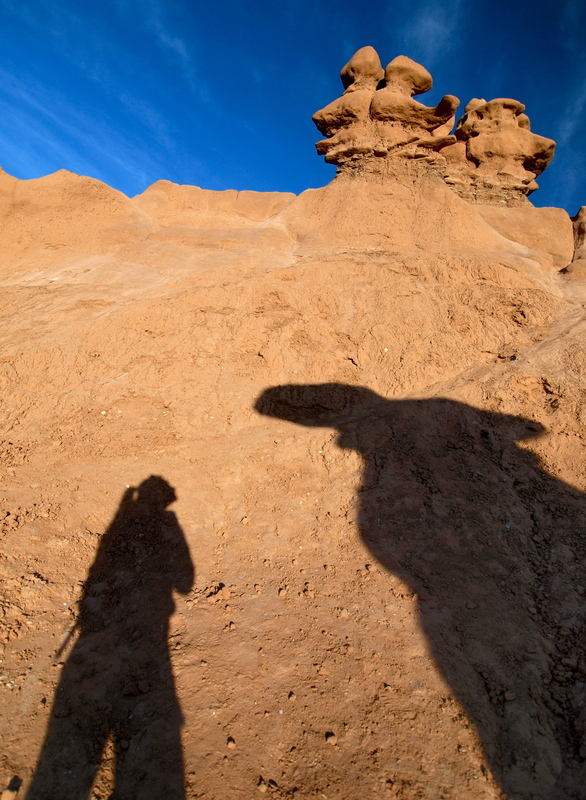 We’re up at dawn the next morning and at the gate to Goblin Valley when it opens at 7 am. The parking lot, so hot and crowded yesterday is completely empty. I’m always amazed how few morning people there seem to be in this world. We have the place to ourselves for at least two hours, in perfect hiking temps, and perfect morning light. I’m jelous of Bowie, nice life. Amazing photos and such unique places to visit, too. Interesting new name of your teardrop, too. When you were sharing photos of Horse Canyon, especially about the boulder wedged in the narrow slot, I kept being reminded of Aron Ralston. 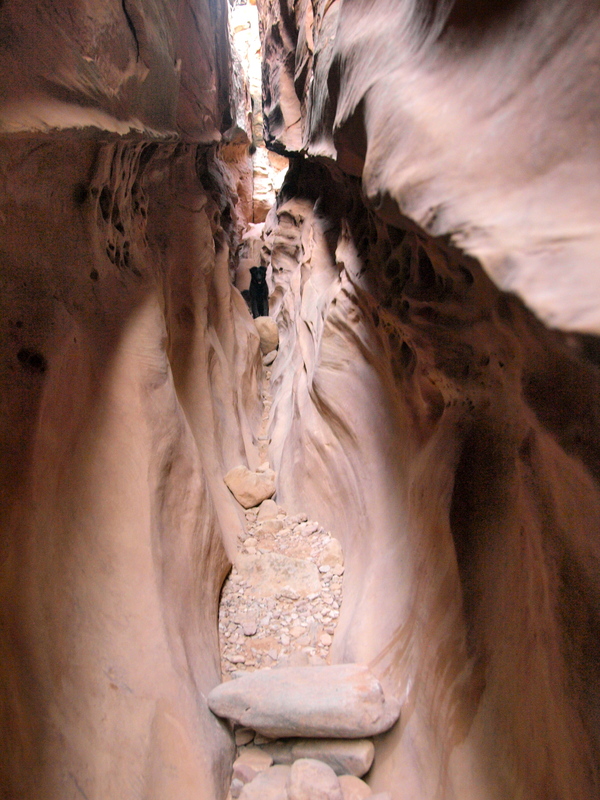 He is the man who hiking in a slot canyon in SE Utah when a boulder fell and pinned his arm. He had to cut off his arm and hand off to survive and get out of the canyon, because no one knew where he was. I’m glad you listened to yours and Dio’s instincts and turned around when things got a little dicey in that too narrow canyon. I hope you are always letting someone responsible know where you are going, when you plan to return, and how long you plan on being gone. You should also leave a note behind inside your teardrop, if you don’t do that already. Be safe…so you can still share these wonderful photos and experiences with all of us.